1. The sunken mezzanine of this pool house has a central concrete fireplace, and separates the bedroom from the washroom. ICRAVE designed this contemporary pool and spa retreat. Photography by John Muggenborg. 2. Black beams frame the patio portion of this modern pool house. Red accents provide a pop of color to the mostly white interior. Artillery designed the South Yarra Pool House in Victoria, Australia. 3. Slats of Douglas Fir have been used to shield the interiors of this pool house. Beside the pool house is a steel and wood trellis, that shelters the dining area. Amantea Architects designed this backyard and pool pavilion for a home near Toronto, Canada. Photography by Tom Arban. 4. Slightly raised from the ground, this pool house with steel white pillars provides a mostly unobstructed view of the gated outdoor pool. 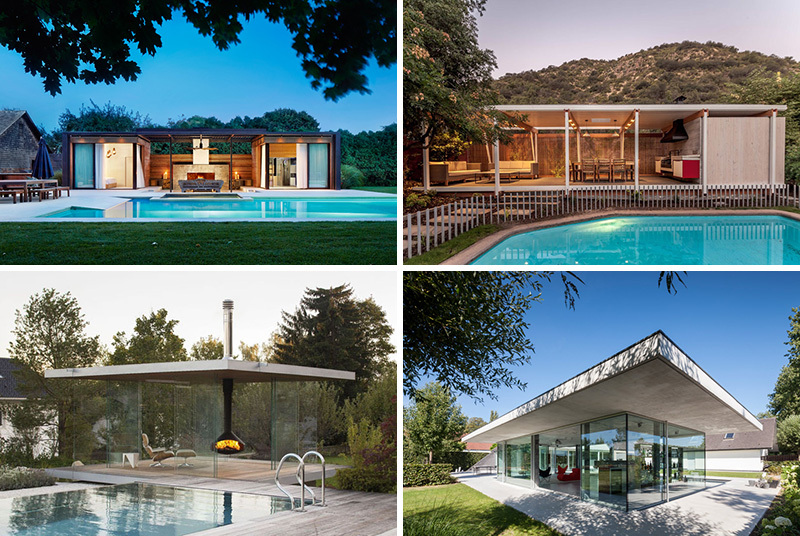 PAR Arquitectos designed this modern pool house in Santiago, Chile. Photography by Diego Elgueta. 5. 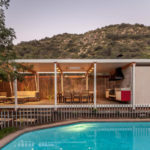 Mid-century inspired, this pool house has large glass sliding doors making it perfect to enjoy both indoor and outdoor space on a hot sunny day. Design firm +tongtong designed the renovation of a mid-century era pool house. Photography by Colin Faulkner. 6. The Pavillion360 is a small modular structure surrounded by glass. A black metal fireplace keeps the space warm, while a pop up cooler provides icy cold drinks. Nuyken von Oefele and Jürgen Stoppel designed Pavillon360. Photography by Weissengruber Fotografie. 7. Surrounded by glass, this concrete pool house provides a great view of outside. A red tiled bar, and cozy seating make this a great place to have a drink after a dip in the pool. 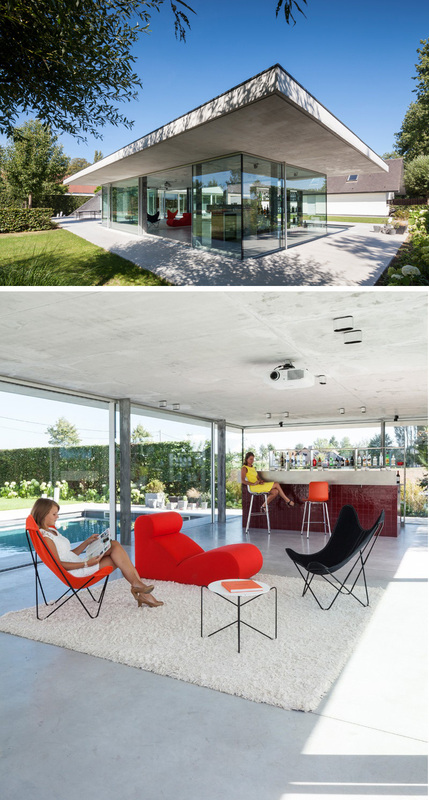 Architect Lieven Dejaeghere designed a glass enclosed pool house for a home in Belgium. 8. This curved concrete and wood pool house provides plenty of space to relax, and enjoy views of outside through the floor-to-ceiling windows. 42mm Architecture designed this pool house in New Delhi, India. Photography by Ravi Kanade. 9. Made from concrete, brick, and glass, this modern pool house is made for entertaining. There’s a full kitchen, swim up bar, and multiple seating arrangements surrounding the pool. 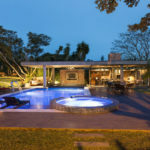 br3 arquitetos have designed this concrete, brick, and glass pool house. Photography by Marcelo Donadussi. 10. 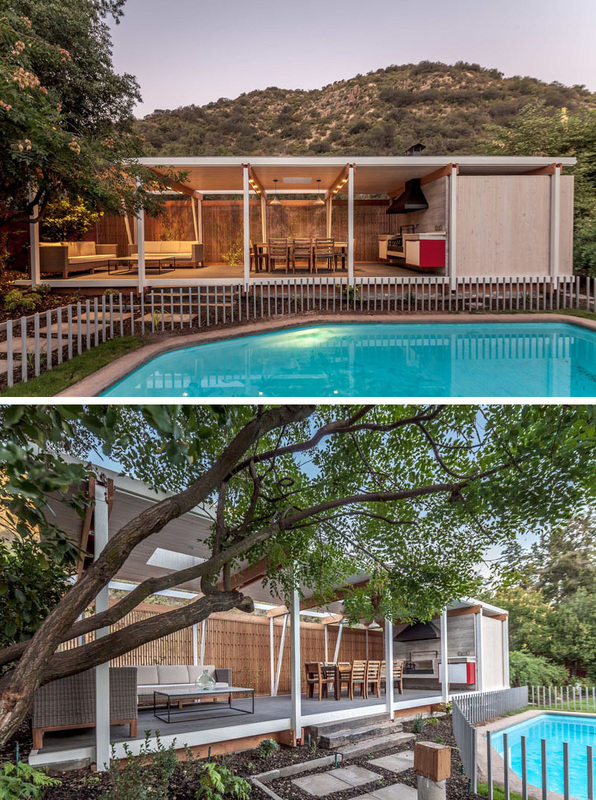 This white and wood pool house features a covered outdoor lounge area with a fire place. Blue upholstered sun chairs line the length of the pool. Blaze Makoid Architecture designed the renovation of a dated house and pool house. Photography by Joshua McHugh. 11. 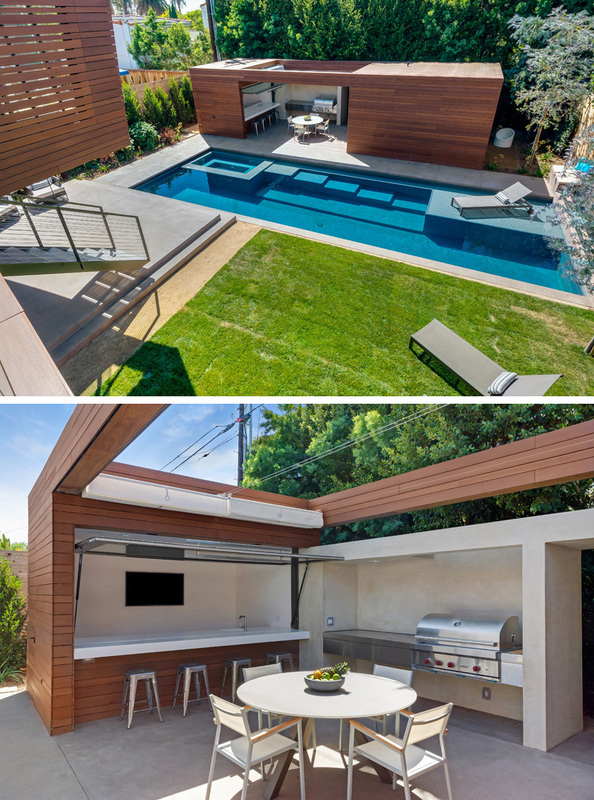 This modern wood and concrete pool house features a bar area with a TV, and a full sized BBQ. A skylight above makes this the perfect place to snack beside the pool. Kovac Design Studio designed this modern wood pool house as part of a new house build.